The Autumn Equinox (also known as Mabon) is celebrated when day and night are of equal duration before the descent into increasing darkness and is the final festival of the season of harvest. For many pagans, this is the time to reflect on the past season, and to recognize the balance of the year has changed. Although the Summer Solstice at Stonehenge attrackts a large crowd, you may expect the Autumn Equinox celebrations to be less attended, with fewer than 1,000 people showing up. 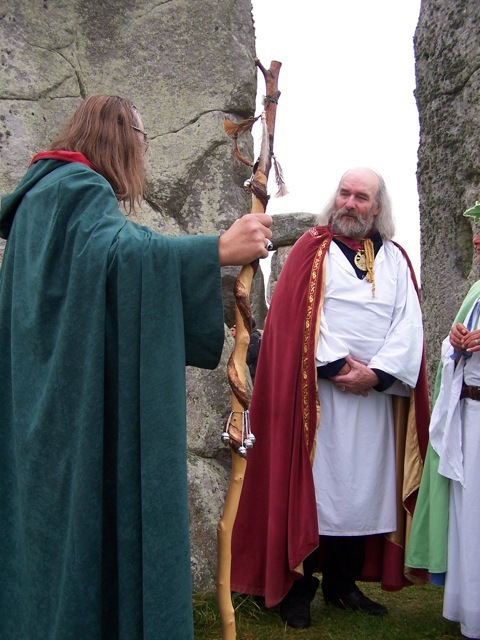 The 2010 Autumnal Equinox takes place on September 23th, at 4.03am UK time (3.03 UTC), but when ‘open access’ to Stonehenge starts is decided by English Heritage and depends on visibility. The sunrise is at 6.48am, and it is expected access to the stones will be allowed from approximately 6.30 to 8.30am. In September is the Fall Equinox, which has come to be called Mabon by many contemporary Neo-Pagans. Occuring approximately on September 21st, this is the day when the hours of daylight and nighttime are once again balanced. Calender days from now until the Winter Solstice will slowly get shorter and shorter in their daylight hours. Agriculturally, this time of year the harvest is now in full swing, with late summer and fall fruits, vegetables and grains being gathered up before winter. This is the time of year a lot of canning or preserving of garden foods takes place. Hunting season also starts around this time, and this was when farmers would slaughter animals and preserve meat for the coming months as well. This holiday is the last of the harvest holidays which began with the summer solstice and continued with Lammas. The Autumn Equinox or Harvest Home is also called Mabon, pronounced ‘MAY-bon’, after the Welsh god Mabon ap Modron, which means literally ‘son of mother’. Mabon appears in ‘The Mabinogion’ tale. The Druids call this celebration, Mea’n Fo’mhair, and honour The Green Man, the God of the Forest, by offering libations to the trees. The Welsh know this time as ‘Alban Elfed’, meaning ‘light of autumn’. This is the point of the year when once again day and night are equal – 12 hours, as at Ostara, the Spring Equinox. The Latin word for Equinox means ‘time of equal days and nights’. After this celebration the descent into winter brings hours of increasing darkness and chiller temperatures. It is the time of the year when night conquers day. After the Autumn Equinox the days shorten and nights lengthen. To astrologers this is the date on which the sun enters the sign of Libra, the scales, reflecting appropriately the balanced day and night of the equinox. This was also the time when the farmers brought in their harvested goods to be weighed and sold. Harvest festival This is the second festival of the season of harvest – at the beginning of the harvest, at Lammas, winter retreated to his underworld, now at the Autumn equinox he comes back to earth. For our Celtic ancestors this was time to reflect on the past season and celebrate nature’s bounty and accept that summer is now over. Harvest Home marks a time of rest after hard work, and a ritual of thanksgiving for the fruits of nature. This is the time to look back on the past year and what you have achieved and learnt, and to plan for the future. The full moon nearest to the Autumn Equinox is called the Harvest Moon and farmers would harvest their crops by then, as part of the second harvest celebration. Mabon was when livestock would be slaughtered and preserved (salted and smoked) to provide enough food for the winter. At the South Pole they will be celebrating the first appearance of the sun in six months. However, at the North Pole they will be preparing for six months of darkness. During Medieval times, the Christian Church replaced Pagan solstices and equinox celebrations with Christianized occasions. The Autumn equinox celebration was Michaelmas, the feast of the Archangel Michael. The triple Goddess – worshipped by the Ancient Britons, is now in her aspect of the ageing Goddess and now passes from Mother to Crone, until she is reborn as a youthful virgin as the wheel of nature turns. At the Autumn equinox the goddess offers wisdom, healing and rest. Mabon Traditions The Wicker man There was a Celtic ritual of dressing the last sheaf of corn to be harvested in fine clothes, or weaving it into a wicker-like man or woman. It was believed the sun or the corn spirit was trapped in the corn and needed to be set free. This effigy was usually burned in celebration of the harvest and the ashes would be spread on the fields. This annual sacrifice of a large wicker man (representing the corn spirit) is thought by many to have been the origin of the misconception that Druids made human sacrifices. ‘The reaping is over and the harvest is in, Summer is finished, another cycle begins’ In some areas of the country the last sheaf was kept inside until the following spring, when it would be ploughed back into the land. In Scotland, the last sheaf of harvest is called ‘the Maiden’, and must be cut by the youngest female in attendance. To Autumn O Autumn, laden with fruit, and stained With the blood of the grape, pass not, but sit Beneath my shady roof, there thou may’st rest, And tune thy jolly voice to my fresh pipe; And all the daughters of the year shall dance, Sing now the lusty song of fruits and flowers. William Blake Mabon is a time to reflect, as we reap the harvest of experience from the past year – the completion of another turn of the Great Wheel. Corn Dollies Corn dollies were also made from the last sheaf and kept in the house to protect the inhabitants from bad spirits during the long winter. Apples To honour the dead, it was also traditional at Mabon to place apples on burial cairns, as symbolism of rebirth and thanks. This also symbolizes the wish for the living to one day be reunited with their loved ones. Mabon is also known as the Feast of Avalon, deriving from the meaning of Avalon being, ‘the land of the apples’. 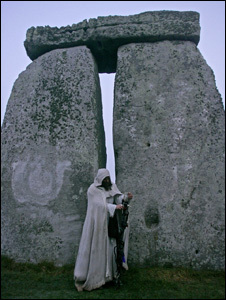 Merlin @ Stonehenge – A good time by all……. The autumn equinox takes place each year when day and night are of equal length, and begins at sunrise on Friday. Afterward, the nights begin to last longer. The equinox also generally marks the beginning of the fall harvest. Fall equinox celebrations take place all over the world. Perhaps the most famous is the event that takes place at Stonehenge (get the details on that event).